For Rolf Seuster, there’s no place like Victoria, Canada. Located on Vancouver Island, about 90 km south of this year’s Winter Olympics, Rolf believes it’s one of the nicest places in the country. “It’s the size of Switzerland, and there’s maybe half a million people on the whole island,” he says. Mountains stand on the north side of the island, where he and his wife Miyuki Hatogai used to walk, and the highest is not unlike the mountains of the Jura. He moved there in 2004 for a post-doc with Victoria University. They stayed until March, 2009, when he took up a position with the Max Planck Institute of his homeland, stationed at CERN. Nevertheless, Rolf enjoyed his childhood there, in a town of 30,000 people with forest not far away. At first, he stayed relatively close, attending RWTH Aachen University two hours away. He took up paragliding for a bit of adventure, trying it out on vacation in Australia and starting courses when he came back to Germany. They were interrupted when he began his PhD, but once Rolf had earned his degree, he finished his certification. Unfortunately, that wasn’t enough to fly Japanese skies, when he went to Tsukuba in 2001, and the additional courses were in Japanese. Still, Rolf had plenty to enjoy during his year in Tsukuba, where he worked with the Belle group at KEK through the University of Hawaii. Studying the charm quark, Rolf also managed to charm his future wife. 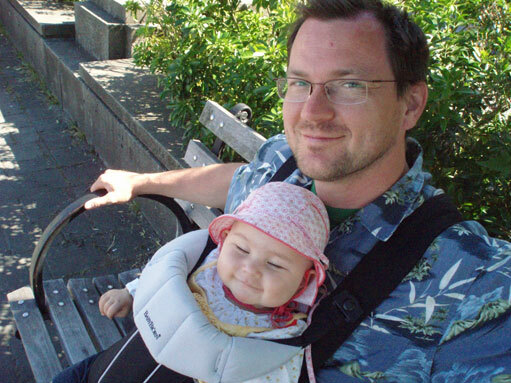 At the close of his first post-doc at the University of Hawaii, Rolf accepted a position with the University of Victoria. Vancouver Island isn’t as near to Japan as the Hawaiian Islands, so he asked Miyuki if she’d like to join him. “Luckily, she said yes,” says Rolf. Half a year before their latest move, to Cessy, France, she gave birth to their first child, Sophie. “She’s really sunshine in our life,” says Rolf of his sixteen-month-old daughter. Although Rolf would like to spend more time with Sophie, he has big shoes to fill at work: from March, he’ll be taking over from David Rousseau as Reconstruction Integration Group Leader. “I will do my very best to follow in his footsteps,” says Rolf. He’ll be leading efforts to ensure that reconstruction runs within time and memory limits and also try to speed up the software.